I’m Richard Tubb, a consultant to IT business owners. For years I have been fortunate enough to regularly sit down and talk with the most successful and smartest people within the IT industry. At the end of those conversations, I have frequently thought “Wow! That was gold! I wish I could share that conversation with others!”. Now, I’m sharing those conversations with you through my Podcast! In TubbTalk – the Podcast for IT Consultants – I invite you to eavesdrop on to my conversations with the IT industries top thought leaders. Learn from the best and listen to the latest insights, news and reviews from the world of IT. 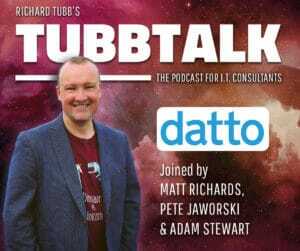 Whether you are an IT Consultant, an IT Managed Service Provider (MSP) or an IT Solution Provider business owner, TubbTalk – the Podcast for IT Consultants – will help you with valuable advice on how to be the best at what you do. 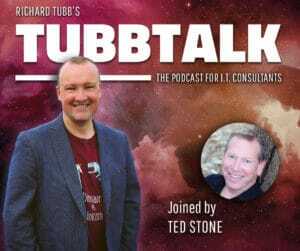 Make sure to subscribe to the TubbTalk – the Podcast for IT Consultants to hear from the best in business, along with insights, news and reviews from the world of IT Managed Services. Richard talks to Leigh Wood, Director of Node IT Solutions, about limiting the software used by clients and the Microsoft Inspire conference. In a special episode, Craig Sharp delivers a presentation on “How to be a Remarkable MSP” at the Continuum Partner Event in London. e talked about how IT businesses need to be different in order to grow and provided real-life examples to inspire his audience. Richard speaks to Chad Savoy and Daniel Camara of Spanning Backup about why MSPs should invest in a separate backup provider rather than relying on the SaaS, and how Spanning makes that easier. Richard talks to Kevin Lancaster, CEO of ID Agent, about how their dark web monitoring tool helps MSPs keep their clients safe. Richard talks to Christian Nagele & Ian Van Reenen about their business journey, from cloud-based RMM operating their company, CentraStage, in a spare room, to being acquired by Autotask and then Datto. Richard speaks with Matt Richards, Chief Marketing Officer, Pete Jaworski, Product Manager, and Adam Stewart, Senior Vice President of Engineering at Datto, which provides business continuity and management for MSPs. Richard hosts a panel of IT business owners who talk about the evolving MSP and what the future holds for IT businesses and their clients. Richard talks to Bob Burg, author and keynote speaker, about his books, The Go-Giver philosophy and dealing with difficult situations. Richard talks to Daniel Welling, of Welling MSP, about why using a specialist third party can help MSPs find the right staff and grow their business. Richard talks to Ted Stone of Customer First UK. Customer First is the owner of a standard called “the putting the customer first standard”. Richard speaks to Paul Green, owner of MSP Marketing Edge, about why MSPs need to focus on marketing themselves to build better relationships with clients.